Near McKee Springs, along the road to the Rainbow Park area of Dinosaur National Monument, several rock art panels are visible from the road. The most dynamic and largest of these panels presented in the black and white rendition and the background is known as the McKee Springs Panel. It is only one of a collection of anthropomorph groups engraved into the cliffs along McKee Springs Wash. Several of the figures bear rayed shields or circles. 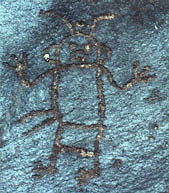 The site includes a unique trapezoidal anthropomorph Kokopelli in side view, probably the largest of all Kokopelli petroglyphs at 48 inches from tip of feather to tip of flute. 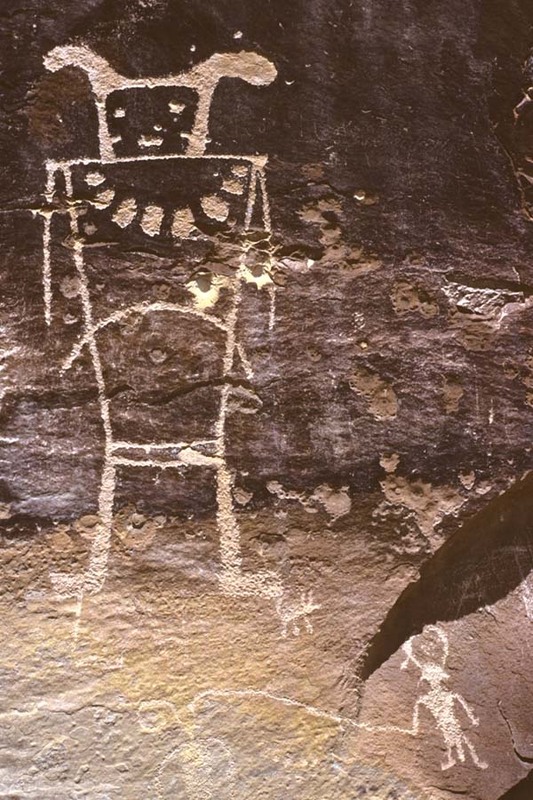 Other glyphs include a 40 inch long snake, sheep, a buffalo, two red paint anthropomorphs, and lots of petroglyphed anthropomorphs about 2 to 3 feet tall with a variety of decorations including antlers, solid horns, belts, waist arc, breast patches, and extra arms. On a narrow ledge in Dinosaur National Monument a series of Classic Vernal Style trapezoidal anthropomorphs decorate the sandstone cliff face. The anthropomorphs are large, 3-5 feet tall. Several are decorated with dot groups on their torsos and heads. 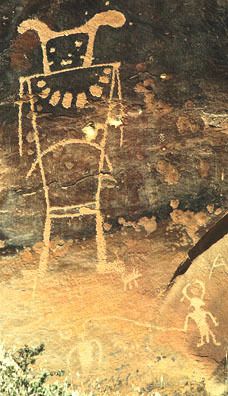 Here again as at McKee Springs Wash and Ashley-Dry Fork several figures are attached to a mushroom-shaped form. While this appendage sometimes has facial features elsewhere, here they are solidly pecked. One of the largest figures has a miniature group adjacent to one shoulder. Located on a high cliff, this site is both hard to find and difficult and dangerous to visit. In the view below note the size of the images. Two necklace dot groups are discernable on the far left of this image. Split Mountain is in the background. 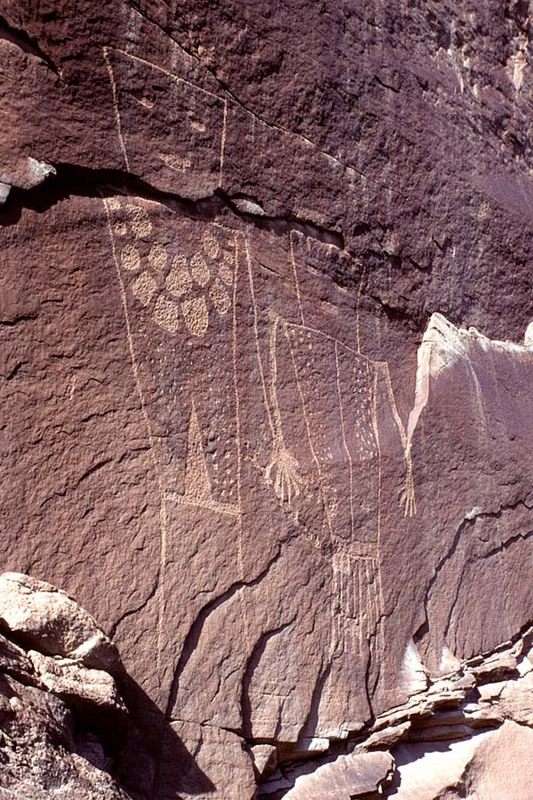 Similar panels to those herein depicted also are known at Cub Creek, Jones Hole, the Echo Park area, and along the lower Yampa River. 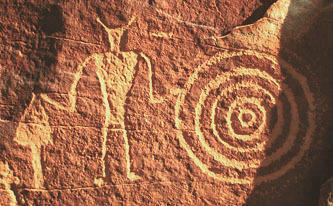 At Cub Creek a large lizard petroglyph can be seen from the roadway. Other panels near thereby are easy to locate. A dots-only anthropomorph is found in this concentration. Some of the Dinosaur National Monument area rock art is easily accessible only by boat or float trip on the Green and Yampa Rivers. One large panel located near Split Mountain Campground has been much damaged by vandalism. 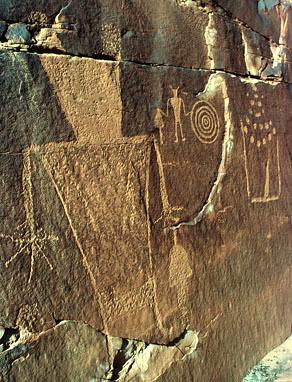 A unique group of images is located just inside the park near the Colorado border along the road to Echo Park. 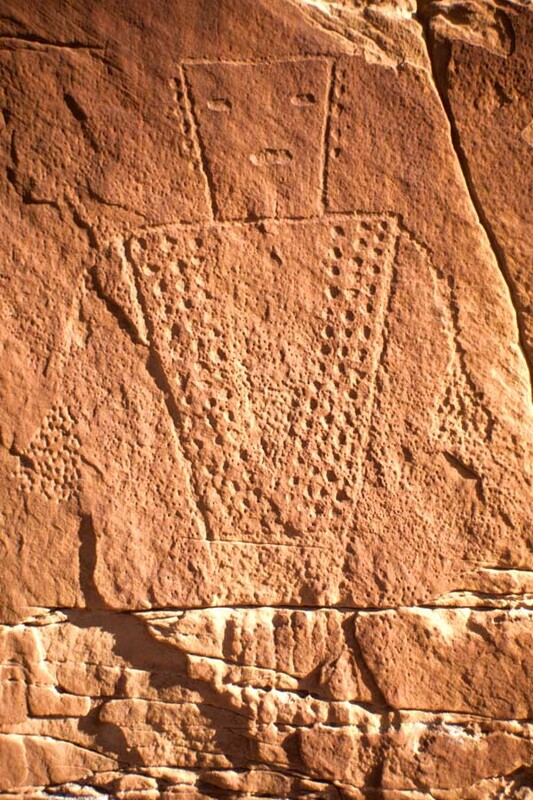 These, the Blue Mountain glyphs, are etched into a horizontal exposure of rock, rather than on a vertical cliff. The flatrock exposure has a heavy coating of blue patina. 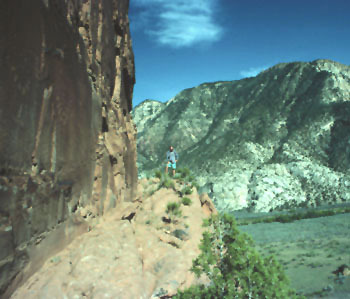 Many smaller and less dramatic sites are also found in the park and surrounding region, including Manila; Roosevelt; Myton, Willow, Hill and Bitter Creeks; and Sweetwater, South, Main and Pine Canyons. 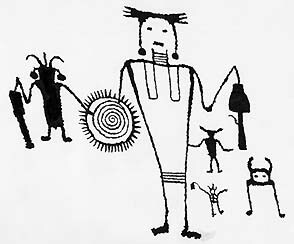 Styles range from Archaic and Fremont to historic Ute and include some unique material. Fremont Couple, Rainbow Park area, Dinosaur National Monument. These two anthropomorphs are unique in that they seem to be holding hands. Their trapezoidal forms and body decorations are characteristics of Classic Vernal Style. 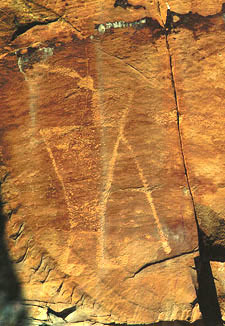 The NEXT page presents more Fremont culture area rock art.